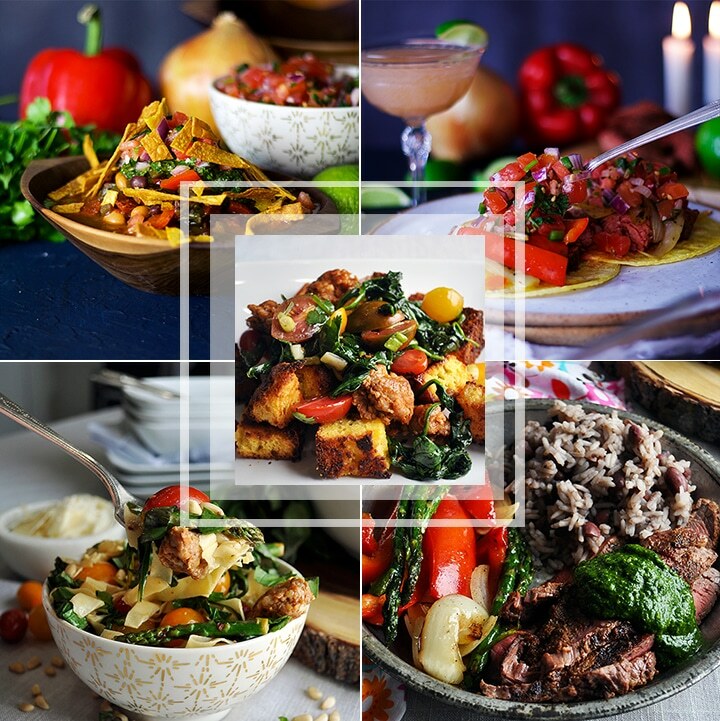 Using some of the same ingredients in multiple dishes throughout the week is the key to getting delicious, wholesome, good for you, home cooked meals on the table several nights of the week. The recipes in each 5-day meal plan include some prep-work for another meal later in the week. For example, in this week’s plan, Grilled Flank Steak is topped with Chimichurri Sauce one day, then folded into tacos another. Slow Cooker Beans make a delicious side dish and form the basis for an easy Vegetarian Chili that even meat lovers will adore. 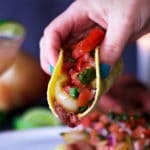 Homemade Pico de Gallo adds a pop of flavor to both the tacos and the chili. Sautéed Vegetables are served alongside steak and folded into pasta. Cheddar Jalapeño Cornbread is the perfect accompaniment to Vegetarian Chili and also creates a surprisingly good Cornbread Salad. 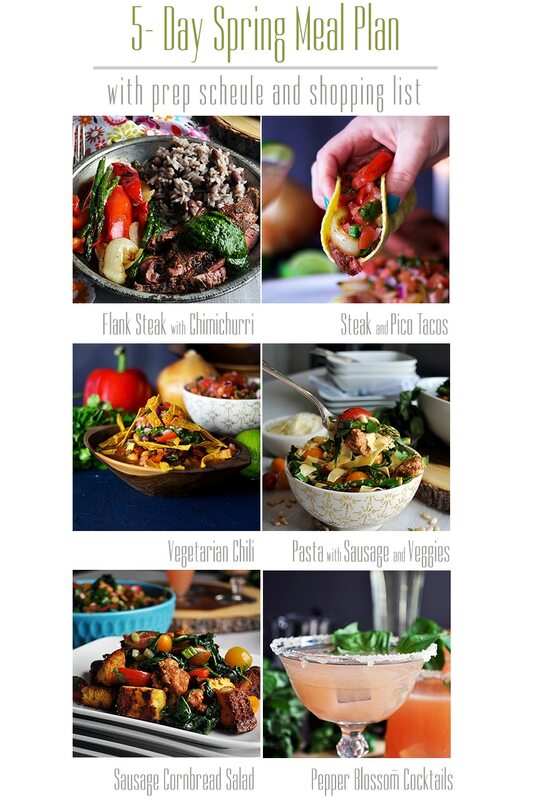 Like every other meal plan on this blog, this week’s recipes are designed to make healthy, delicious, home cooked meals every night of the week much easier with each meal building on the previous night’s efforts. A little = a lot. *This meal plan is based on a family of 4 with a couple of meals making more than 4 servings so that you have some leftovers for lunches, etc. At the start of the week, take a quick glance through each day’s “PLAN AHEAD” notes and plan accordingly. For me, “Day #1” is usually a Sunday, and it’s the day with the most heavy lifting when it comes to meal prep for the rest of the week. I am always so grateful to myself for taking a few of hours on Sunday to make getting dinner on the table that much easier the rest of the week. Make Chimichurri Sauce . This sauce will take about 10 minutes to make. 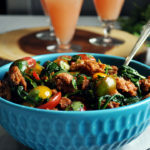 Spoon it over Flank Steak tonight and reserve the leftover sauce in the refrigerator to top Vegetarian Chili on Day #3. 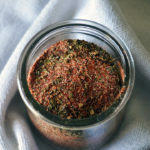 Mix up a batch of Grilled Flank Steak Dry Rub , and use it to season tonight’s steak. Make rice and beans: Cook 1 & 1/2 cups of dry long-grain rice according to the package instructions. Add the rice and about 2 cups of beans to a saucepan set over low heat. Ladle in about 1/2 cup of the cooking liquid from the beans. Cook just long enough to heat through, stirring frequently. Taste and adjust seasoning. Reserve leftovers to serve with Steak Tacos on Day #2. Make Perfect Sautéed Vegetables . Serve half of the vegetables tonight. Combine the remaining bell peppers and onions in a container and reserve in the refrigerator for Steak Tacos on Day #2. Reserve the remaining asparagus for Pasta with Sausage and Vegetables on Day #4. Follow this recipe to grill 4-6 pounds of steak. How much you grill really depends on how much you think your family will eat. An average serving is 1/2 to 3/4 pound per person. Make enough for dinner tonight with 2 pounds left over for tacos on Day #2. Prepare Pico de Gallo . Reserve in a covered container in the refrigerator for Steak Tacos on Day #2 and Vegetarian Chili on Day #3. Follow the first step in the recipe for Vegetarian Chili to roast, peel, and chop the poblano peppers. Store in a covered container and reserve in the refrigerator. This meal prep task can be done the night you make the chili, but doing it now will save you about 10 minutes. Thanks to the prep work you did on Day #1, tonight’s steak tacos will be on the table in about 15 minutes. Simply follow the recipe to warm the tortillas, reheat the steak, red peppers, onions, and rice & beans you cooked on Day#1, pull the Pico de Gallo from the refrigerator and dinner is served. 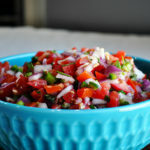 If you haven’t made the Pico de Gallo yet, get it prepared before making the tacos. Reserve leftover pico for Vegetarian Chili on Day #3. Get the cornbread batter mixed up so that you can let it bake while you prepare the chili. (Or, enlist a helper so one of you can make the chili and the other can make the cornbread.) *The cornbread recipe will make 8 servings. Serve 4 tonight, and reserve the other 4 for Cornbread Salad on Day #5. If you need more than 4 servings of cornbread for dinner tonight, just double the recipe. If you haven’t already, while the chili simmers, grate 1-2 cups of cheese and follow the instructions in the recipe notes to fry some tortilla strips while the chili simmers on the stovetop. Tonight’s meal comes with a bonus tutorial: Pasta Making with Judy (Pasta Making 101). My friend Judy is a pasta making queen, so using her tutelage to create this “how-to” post was a no-brainer. Making homemade pasta is, of course completely optional. If you’ve never made fresh pasta, and have the inclination, the tutorial will walk you through the ins and outs of pasta making. Fresh pasta is nothing more than flour and eggs, and requires only the patience to knead dough and run it through a pasta machine. It’s superior in flavor and nutrition. But, it does take some time. If you don’t have time, just use purchased dried egg fettuccini noodles. Remember the leftover sautéed asparagus you cooked on Day #1? Pull that out of your refrigerator, you’ll need it for this pasta dish. This recipe will use up the leftover Cheddar Jalapeño Cornbread you reserved from dinner on Day #3 and extra sausage you cooked on Day #4. It is a surprisingly unique way to use up leftover cornbread that might have you making cornbread just so you can make this salad. Gin, St. Germain, grapefruit juice, sliced Jalapeño, and fresh basil come together for a deliciously balanced and refreshing blend of spicy, sweet, and sour. Several of this week’s recipes require a large skillet and a heavy bottom saucepan. If you don’t have these two items, here are the ones I suggest. If you’re planning to try your hand at homemade pasta, I highly suggest investing in a pasta machine. I’ve made homemade pasta without one and it’s a pain in the you-know-what. There are probably a lot of good pasta machines out there, but the one below is what I use, and I recommend it highly. A food processor makes quick work of chimichurri sauce, amongst many other things. It’s another appliance in my kitchen that I don’t know what I’d do without. *Does not include ingredients for suggested baked goods. Receive an email notification every time a new weekly menu is published. 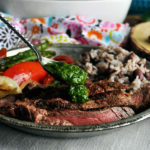 Simple grilled flank steak seasoned with a dry rub of cumin, chili powder, garlic and oregano and topped with the bright, fresh flavor of Argentinian Chimichurri sauce makes for a simple flavor-packed meal. *This recipe has been modified to fit this week’s meal plan. Click here for the original recipe. Flank steak: An average serving is 1/2 to 3/4 pound per person. Make enough for dinner tonight with 2 pounds left over for tacos on Day #2. Rub each side of the flank steak with a bit of olive oil. Rub both sides with a generous amount of Flank Steak Dry Rub, coating the steak completely. Sprinkle with salt and pepper. Grill the steak to your preferred level of doneness on an indoor or outdoor grill. Medium-rare (140-145 degrees) will take approximately 6 minutes. Medium (155-160 degrees) will take just a couple of minutes longer. Try to remove the steak from the grill a right before it reaches the desired temperature because the steak will keep cooking for a bit after you remove it from the heat. Let the steak rest for 5 minutes on a cutting board to let the juices settle. Carve and serve with Chimichurri Sauce. Cooking dried beans in a slow cooker produces richly flavorful, tender beans that will save you money and taste better than anything you’ll ever find in a can. 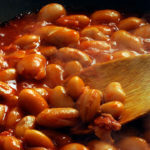 Slow cooker beans take about 4 hours on high and 6 hours on low. This recipe yields 6-7 cups. You’ll want approximately 1 & 1/2 cups for and 3 cups for Vegetarian Chili on Day #3. Freeze leftover beans in airtight containers for up to 3 months. Pour beans into a colander and rinse in the sink for a minute or so. Pour into your slow cooker. Add remaining ingredients plus 8 cups water, or chicken or vegetable broth. Stir to combine, put the lid on the slow cooker and let cook for 4 hours on high or 6 hours on low. Sautéed vegetables are just about the easiest, fastest way I can think of to add more vegetables to a meal, other than just putting out some pre-cut carrot and celery sticks. The trick to perfectly sautéed veggies every time is to slice them uniformly and then cook them quickly in a very hot pan with a minimal amount of oil. 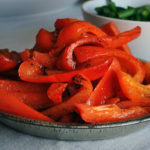 Cooking vegetables over low heat, or cooking them too long, or in too much oil, results in soft soggy vegetables – not very appealing, in my opinion. For bright veggies that are tender-crisp, cook them quickly in a very hot pan, using the minimum amount of oil necessary to keep them from sticking. Remove the stem and seeds from the bell peppers and cut into 1-inch wide slices. Peel the onions, cut in half, length wise, then cut each half into 1-inch wide slices. Snap the asparagus in half, allowing them to break wherever they do naturally. Discard the tough bottom half of the stalks. Heat about 1 tsp of oil in a sauté pan or wok over high heat until the oil is just beginning to smoke. If using a 12-inch pan, add about 1 to 1 1/2 cups of vegetables to the hot oil. If your pan is smaller or larger, adjust accordingly. You want to be able to spread the vegetables into an even layer across the bottom of the pan so that each pieces is touching the pan. If they are stacked on top of each other, there are too many in the pan at once. Using a wooden spoon, spatula, or tongs, toss the vegetables around in the hot oil for a few seconds. Sprinkle with salt and pepper. Continue to toss until they are crisp-tender and blackening in spots. This will happen quickly. Have a fork ready beside the pan so that you can quickly remove one pice and bite into it to test. Immediately remove from the pan to a plate or serving platter. Repeat with remaining veggies. If desired, squeeze a bit of lemon juice over the cooked vegetables and toss. Taste and add more salt and pepper if desired. 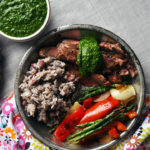 Chimichurri sauce is a magical green sauce that’s one of the best ways to instantly brighten a dish with fresh flavor and color. Aside from being totally delicious, it’s healthy, versatile, and super quick to prepare. Depending on the size of your food processor, you might need to make this in two batches. Add all ingredients plus 1/2 cup of the olive oil to a food processor fitted with the chopping blade. Blend until smooth, 1-2 minutes. Check the consistency and taste for seasoning. Add as much olive oil as you like to achieve the consistency you want. 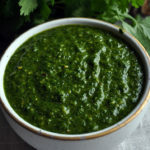 Chimichurri sauce can be made in a food processor or blender. I usually make it in a food processor because the blender creates a very smooth sauce and I prefer a more “chunky” consistency. Likewise, add as much olive oil as you like to achieve the desired consistency. If you want your chimichurri sauce to be thin and pourable, add more olive oil. If you want it to be more of a salsa-like consistency, add less. Stir all ingredients in a small bowl until well blended. Store at room temperature, covered, for up to 6 months. The following ratios reflect my personal Pico de Gallo preferences. Adjust as desired. There’s no one “right” way to make Pico de Gallo. Add all ingredients to a large bowl and toss to combine. Taste and add more salt, sugar, or lime if desired. 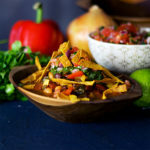 Vegetarian Chili packed with beans, onions, poblano peppers, red bell peppers, zucchini, and tomatoes that are simmered in a spicy red wine broth, then topped with chimichurri sauce, fresh Pico de Gallo, and fried tortilla strips. *This recipe has been modified to fit this week’s meal plan. 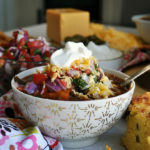 For the original recipe, including ideas for what to do with leftover chili, click here. Line a baking sheet with aluminum foil and preheat the broiler in your oven. Lay the poblano peppers on the baking sheet and broil until the skins of the poblano peppers are at least 90% black. Turn the peppers over and broil until the peppers are blackened on the other side. Remove from the oven and place in a bowl to cool. Once cool enough to handle, peel the blackened skin from the peppers, removing the stems and the seeds. Dice the peppers and set aside. In a small bowl, mix the garlic, chili powder, cumin, oregano, sugar, salt, pepper, and tomato paste. Set aside. Heat the oil in a large sauce pan or dutch oven set over medium heat. Add the onions and jalapeño, and cook, stirring frequently, until the onions are soft and translucent. Add the chopped red pepper and sliced zucchini to the pan and cook 1 minute longer. Stir in the garlic-spice-tomato paste mixture and cook, stirring frequently, for 3-4 minutes. Pour in the wine, and cook, stirring frequently, until much of the liquid has evaporated – about 5 minutes. Stir in the beans and cook a minute or two longer to heat through. Add the lime juice and cilantro. Taste, and add more lime, cilantro, or salt if you like. You can substitute an 8 ounce can of chopped green chilies for the poblano peppers if you prefer. If you want to cook a batch of dried beans to use in this chili (as opposed to canned), follow the instructions in this recipe for Slow Cooker Beans. Line a baking sheet with paper towels and set near the stove along with a small dish of salt. Pour enough vegetable oil into a large skillet to come up the sides of the pan about 1-inch, and place over hight heat. Cut corn tortillas in into strips about 1/2 inch wide. Add a small piece of corn tortilla into the hot oil to see if it’s hot enough; if it immediately begins to sizzle, with bubbles of oil forming all around it, the oil is hot enough. If you have a deep fry thermometer, which can be super helpful, heat the oil to 350 degrees. Fry the tortilla strips in the hot oil in a couple of batches, being careful to not over crowd the pan. When the strips are a deep golden brown, carefully remove them from the hot oil with tongs and immediately sprinkle with some salt. Strips of seasoned, grilled flank steak and sautéed red peppers & onions are layered inside warm, soft corn tortillas and topped with the bright, fresh flavor of Pico de Gallo. Reheat the steak, peppers, and onions that you prepared on Day #1 in the microwave, or in a 350 degree oven. (If you haven’t cut the steak, slice it as thinly as possible across the natural grain of the meat. Brush both sides of a corn tortilla with a light coating of corn oil and place in the center of a damp paper towel. Brush only one side of a second tortilla with a light coating of corn oil and place oil side up on top of the first tortilla. Continue with however many tortillas you plan to serve. Cover with a second damp paper towel and microwave for 30 seconds. Remove from the microwave and feel into the center of the stack to see if it’s warm. If not, microwave for a bit longer. Serve tortillas with sliced flank steak, sautéed peppers and onions, Pico de Gallo, and sour cream, if desired. 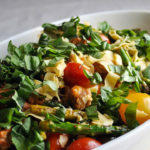 Egg Fettuccini Pasta is coated in a Lemon Caper Sauce and tossed with Italian Sausage, Asparagus, Cherry Tomatoes, Parmesan, Pine Nuts and fresh herbs. Heat oil in a medium sized saucepan set over medium-high heat. Add the diced shallot and cook, stirring constantly, for about 30 seconds. Add broth and lemon juice and simmer over medium-high heat until reduced to about 3/4 cup (about 5 minutes). Remove from the heat and stir in the butter until fully melted and incorporated. Stir in capers and fresh parsley. Cover to keep warm and set aside. Cook the pasta: Fill a large pan 2/3 full with water and add a tablespoon of salt. Bring the water to a boil, add the pasta and cook until almost al dente (cooked through but still firm when bitten into). Refer to the package for approximate cooking times. 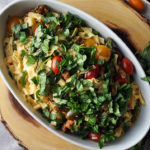 The goal is for the pasta to be just slightly underdone because it will keep cooking after you remove it from the heat and toss it with the warm lemon-caper sauce. Homemade fresh pasta, will cook very quickly – in about 2 minutes – so watch carefully. Drain the pasta in a colander set in the sink and return it to the pot it was cooked in. Pour the lemon-caper sauce over the pasta and toss. Cover to keep warm. Heat 1 tbsp oil in a large skillet set over medium heat. Add the ground sausage and cook until no pink remains in the middle of the pieces of sausage. *Reserve half the cooked sausage for Cornbread Salad on Day #5. Add the cooked sausage to the pasta along with the sautéed asparagus and cherry tomatoes. Toss to combine. Serve along with any or all of the optional toppings. Jalapeño Cheddar Cornbread tossed with Italian sausage, cherry tomatoes, and spinach in a quick vinaigrette. Plenty of other vegetables would be delicious tossed into this salad. So, if you have a few stray veggies in your refrigerator that you’re not sure what to do with, toss them in, sautéing them first if you like. *This recipe has been modified for this week’s meal plan. Click here for the original recipe. Preheat oven to 400 degrees and line a baking sheet with aluminum foil. Cut the cornbread into 1/2 to 1-inch chunks and spread out on the baking sheet in one layer. Bake for 15-20 minutes until the cubes are a deep golden brown. Remove from the oven and allow to cool completely. Add the cooked Italian Sausage to the skillet and cook, stirring frequently, until the sausage is heated throughout, about 1 minute. Dump the sausage and spinach onto a plate or a bowl and set aside. Cut the tomatoes in half and add to a large bowl along with the sliced green onions, and chopped cilantro. In a small bowl, add the 1/3 cup olive oil, rice wine vinegar, salt and pepper. Whisk vigorously to combine and then pour over the tomato mixture. Toss to coat the tomato mixture with the dressing. Add the cooked sausage to the tomato mixture and toss to combine. 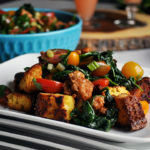 To serve, add 1 cup of cornbread cubes to a plate and top with sausage tomato mixture. If you have any leftover, store the cornbread and sausage-vegetable mixture in separate containers, the cornbread at room temperature and the sausage-vegctable mixture in the refrigerator. Bring the sausage-vegetable mixture to room temperature by zapping it in the microwave for 30 seconds or so at half power. Stir, test the temperature, and cook a few seconds longer if necessary. Add the gin, jalapeño slices, and basil leaves to a liquid measuring cup and muddle a bit to release the flavor of the jalapeño and basil. Let sit for at least 15 minutes. 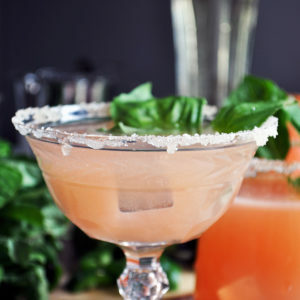 Wet the rim of a glass with grapefruit juice and coat with sugar (optional). Fill with ice. 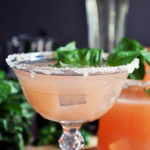 Strain the gin into a cocktail shaker and add the St Germain and grapefruit juice. Stir or shake to combine and pour into the ice-filled glass. Top off with a bit of club soda (optional).